Costs of Trading in Philippine Stock Market- How much will you need for your first order? Do you think you’re too small to begin investing? Do you believe it takes huge capital to make your money work for you? With only Php 5000, you can already start investing in Philippine stock market… and even mutual funds and Unit Investment Trust Funds (UITF’s). One of the common misconceptions about investing in a stock market is the initial thought that it’s only a game for the rich guys. They believe that they need to be millionaires first, or close to that, to actually start making their money work hard for them. Of course that’s one of the biggest financial illusions you can ever believe. While it’s true that there are people in the upper class playing in this battlefield, that doesn’t mean it’s an exclusive playground for them. A friend actually asked me if one would need any credential to dive into it. I gave a short answer: “Appreciating your asset to produce more assets, much like a tree bearing it sweet fruits, that’s the only credential your will ever need”. If you’re like that, you’re very welcome to this financial vehicle. Allow me to sing your first lullaby. Personally, I started investing with a humble 10k initial deposit. Many hard-core players would really laugh at me, but I was more than happy just giving it a try. And looking back I just couldn’t imagine the journey that little initial amount had unraveled. It was year 2010, the same year I finished my college and landed on my first job. A sweet new voyage for a new phase of my life. Obviously, it’s not precisely as simple as that. So let’s do the exact math here. In reality though, your broker will do it automatically for you each time you place an order, so you don’t really need to dwell on this. But just so you won’t be surprised with all the associated fees and charges that add to your buying amount (or subtract from your sale proceeds), it seems imperative to have a look on this. *Varies depending on the stockbroker’s fee structure. All these charges add to (in case of a buy order) or subtract from (if it’s a sell order) the Gross Trade Amount or Transaction Amount. Gross Trade Amount = Number of shares*Price per share. Note that the above 0.25% stockbroker’s commission applies to specific online brokers only. The 0.25% is actually the smallest commission any broker can get from every transaction. Personal live brokers can charge as high as 1.5% of the transaction amount given that they obviously get involved in a more tedious process compared to doing it all online. Now you see one of the beauties of using online brokers. The 12% Value-added Tax (VAT) is levied on the commission charge. The PSE Trans Fee and SCCP Clearing fee are other miscellaneous charges as these institutions are also involved in the orders matching and processing cycle. You will also notice that the only difference between buying and selling is the additional sales tax in the latter. The 0.5% amount actually makes it the largest slice among all the trading charges in all your sales. At this point, one will realize that with the presence of these transactional fees, you cannot get breakeven from a previous buy order by simply selling it at the same price you bought it. Doing so will definitely entail losses in your part. As a consequence you would need first to wait for the stock price to rise by around 2.25% to get by and get your whole money back. You can calculate exactly what that pivotal price is by doing your own math with the help of the table above, or by using a ready MS Excel-based stock calculator. (You can get your tool for this here). Check exact figures from your broker. The above table shows only the basic computation, but it can have slight modifications from the actual computation of your stockbroker. In Philstocks for example, PCD Ad Valorem (PSE Fee) includes transaction and other brokerage fees of .0002 totaling to 0.0002217 of the gross trade amount. For Citiseconline/COL Financial, the table above shows their exact computation. As a practice example, you can look at below sample confirmation invoices from Citiseconline (COL) for a buy and sell transaction, and confirm that all the figures can be derived from the table above. Below is an update from COL Financial regarding the recent update in fees due to implementation of TRAIN Law. It’s safe to say now that that you can actually have your first buy with as low as 5k. 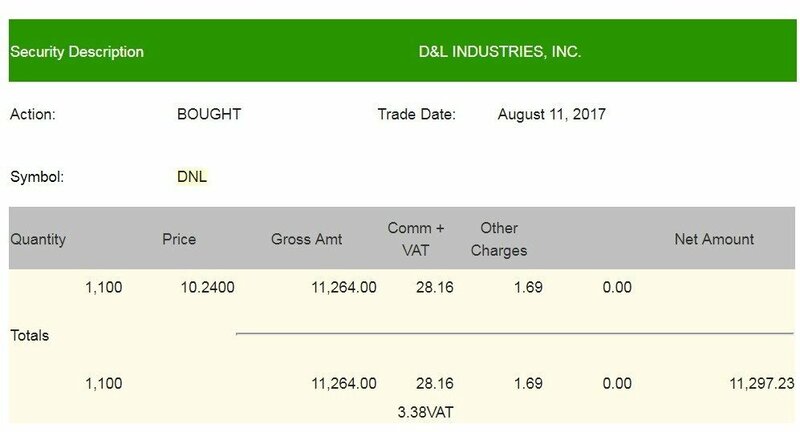 In fact my first ever transaction cost me less than 4k (using Philstocks broker). It was the purchase of 2000 shares of MEG when it was still at 1.87 pesos per share, which I excitingly sold three days after at an appreciated price of 2.05. HAHA. You see, you really don’t need big chunk of cash to begin investing. Never make that excuse of having not so much money to begin empowering your financial life. If you know Bo Sanchez, his maids and drivers have actually started investing earlier than me (which is by the way one of the things that pushed me to do the same). I’m pretty sure you earn way far bigger than those folks. So if they were able to do it, there’s no reason why you can’t. Just be very careful doing it though! May this year be a breakthrough in your finances! PS: To be more honest, the story of Bo Sanchez’s maids investing in stocks is a big part of the motivation why I did the same. I just couldn’t accept that in the future, a maid will be better off financially than me notwithstanding the bigger salary I have. Pride I think. HAHA. And so I’m spending all the time I have now to catch up with them. Join me in that challenge too! Read and be inspired by their story here – Download Bo’s My Maid Invests in the Stock Market and Why you should too! Good to hear! Happy investing sir Erwin! Just a question as im an OFW. Would there be any required other taxes once we get our profit? Since COL financial is requiring the TIN in the profile, do we need to file ITR for any profit? thanks for the kind words ms Arlet! This post is really encouraging for fresh grads like me. I’ll keep this in mind! Thanks, and please don’t stop blogging about investing!